Hi all! Had a nice birthday yesterday! Thanks!! Wolf & HalT... and everyone! Hope someone brings sunshine into your life today! If not, take some into someone else's! Good morning all. Perfectly dreary day to day. Slow today. Interrupted by an 800 call from 'Microsoft Refund Dept.' Yeah, right!!! Cannot believe the number of scam calls we are getting. Probably 3-5 for every legit one. Morning. Hope everybody survived Halloween. 1:41, not with it this morning... Hi everyone. Morning all,the Wallaby is watching you,Vici. We are expecting a hot day but have cloud cover at the moment. Hope it stays that for a while. Good Morning everyone! I am enjoying the morning cool! I may as well try for it. Well, claiming 22 was easier than today's Easy which I did 9-&GT;7 then when 6 wasn't a straightforward complete solve I dropped back to 1-&GT;6. Evidently no one else is around, so I'll take my cp and be on my way. I hope Jiminoregon (or perhaps Arizona by now) stops in to enjoy his birthday greetings. 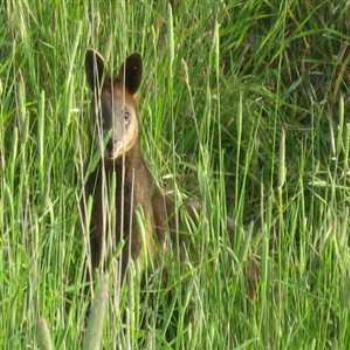 I really like that wallaby in the grass photo - as if he is considering himself concealed - haha! Our sunshine has disappeared... & we're beginning to think it may never appear again! This must be the 3rd week of non-stop rain; it's mighty tiresome too! I lived on Phillip Island as a boy! Lots of koalas then, fairy penguins and plenty of snakes. Life was OK then. Plenty of tigers and browns, DoA. To Denny from Napa Valley and all others who may have the same problem with incoming calls: I used to have that problem also until I learned about call blocking. I my area, simply by dialing *61 the latest incoming number is added to a list of blocked numbers and you will never hear from them again.